Mr. Great Lakes (Jeff Kart). The Environment Report, for June 28, 2013. Part of Friday Edition, on Delta College Q-90.1 FM. 1 – Michigan beaches were closed for hundreds of days in 2012. The beach at the Bay City State Recreation Area in Bay County. That’s according to an annual (2012) beach monitoring report from the Michigan Department of Environmental Quality. In Michigan, beaches are monitored by local health departments, who test for E. coli bacteria in swimming areas during the summer months. Monitoring was conducted last year at 423 public beaches in 56 Michigan counties. There were a total of 166 postings for advisories or closures, which lasted a total of 755 days. The number and percentage of public beaches with high bacteria levels was slightly lower than in 2011. The total number of days with advisories or closures also fell from 913 in 2011 to 755 in 2012. In Bay County, a boat launch on the Kawkawlin River was under an advisory or closure for a total of 79 days in 2012. 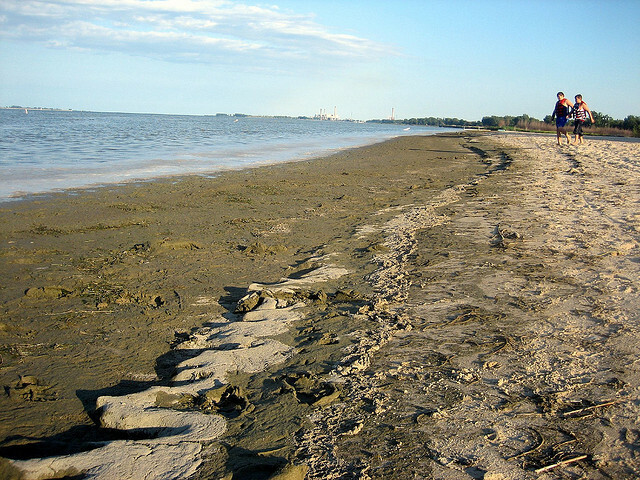 Brissette Beach on Saginaw Bay was closed for four days. Pinconning Park’s beach was closed for five days. South Linwood Beach was closed for three days. Wenona Beach was closed for two days. A Portsmouth Township beach was closed for seven days. The Alliance for the Great Lakes, an environmental group, says climate change is already affecting the lakes, and the trend is expected to continue. The group points to warmer Lake Michigan temperatures, warmer winter air temperatures, and reduced ice cover. The Obama plan is aimed at reducing carbon emissions, which contribute to climate change. Key points include directing the U.S. Environmental Protection Agency to work with states, industry and other stakeholders to establish carbon pollution standards for new and existing power plants, and directing the Department of the Interior to permit more wind and solar projects on public lands.